It's been a while since I've done a post on a lunch or dinner party, hasn't it? We had some friends over for lunch on the weekend, and I thought I'd take the opportunity to do some menu planning and put a little something special together! I wanted a crowd-pleasing menu that would let me flex my culinary creativity (I haven't been cooking or baking that much lately), that still wasn't too difficult or time consuming to put together. I'm pleased to say the following meal was the result! 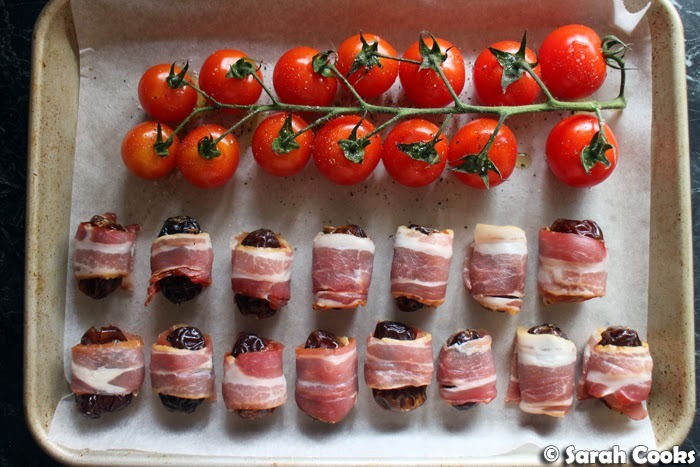 I've blogged the bacon-wrapped dates before, and can highly recommend them as an easy and delicious starter. They've got a bit of a retro-chic vibe going on, making them a bit unusual, bit still super tasty! 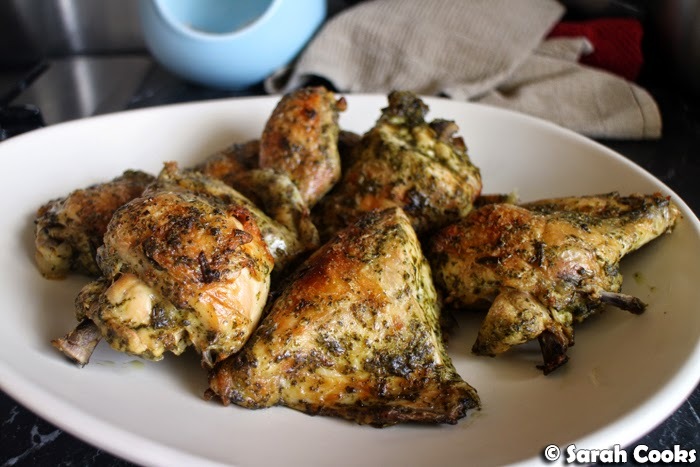 The herb and mustard roast chicken was an amalgamation of two recipes - a Donna Hay marinade and Nigella's method of a 2-hour slow-braise followed by a blast in a hot oven for tender meat and crisp skin. It turned out really well, and I'll be blogging the recipe shortly. The creamy potato gratin and petits pois à la française are Nigella recipes from Nigella Bites and Feast respectively, both old favourites that I've made dozens of times and can highly recommend. The roast cherry tomatoes I made because pretty. I chose a classic French strawberry tart for dessert (crisp almond pastry, crème pâtissière, fresh strawberries), because I knew it was the favourite dessert of one of our guests. Again, recipe to come! It wasn't difficult cooking the whole menu - the night before, I baked the almond pastry tart case, ready to fill, and pitted the dates and wrapped them in their bacon blankets, ready to bake. 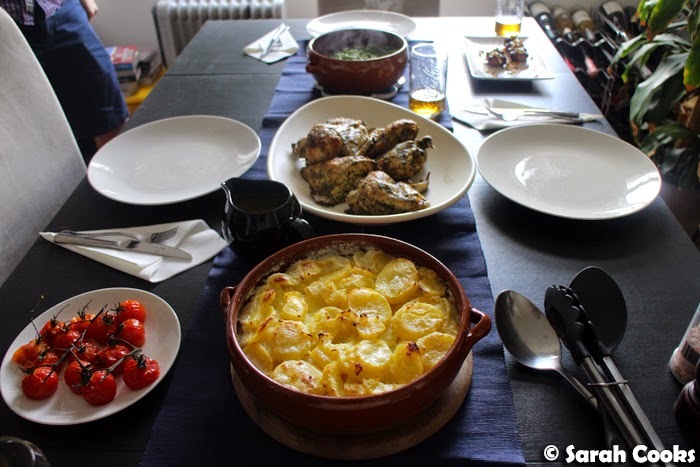 On the morning of the lunch, I started by marinating the chicken and putting it in the oven for its slow roast, then used that time to make the crème pâtissière and assemble the tart, and make the potato gratin and peas. Twenty minutes before our friends were due to arrive, I put the dates and tomatoes in the oven to roast, and when they got here, I finished off the dates with the chives, aioli and pine nuts and served them. While we were eating the dates, I reheated the peas, and put the chicken and potato gratin in the oven to brown up and heat through. Boom. Lunch! Wow, I really love scheduling activities! Enough words, picture time! Not that you really need a recipe for roast cherry tomatoes, but by way of instruction, I drizzled them with olive oil, sprinkled with salt and pepper, and roasted at 200C until they were soft and the skin was blistered. 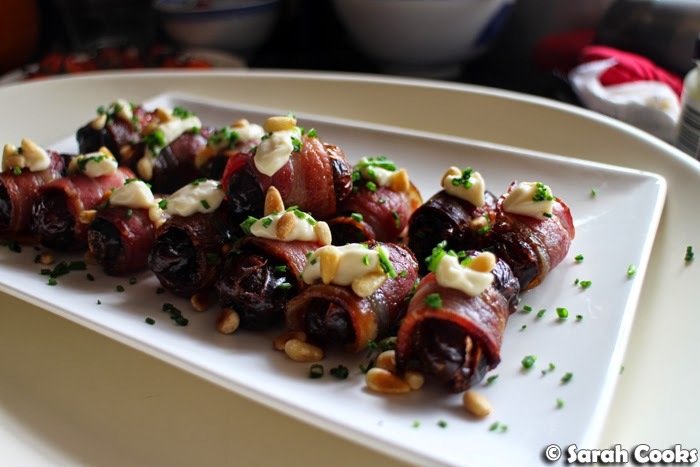 Gah, I love those dates - sweet, soft Medjool dates, and Peter Bouchier dry cured streaky bacon. Best. 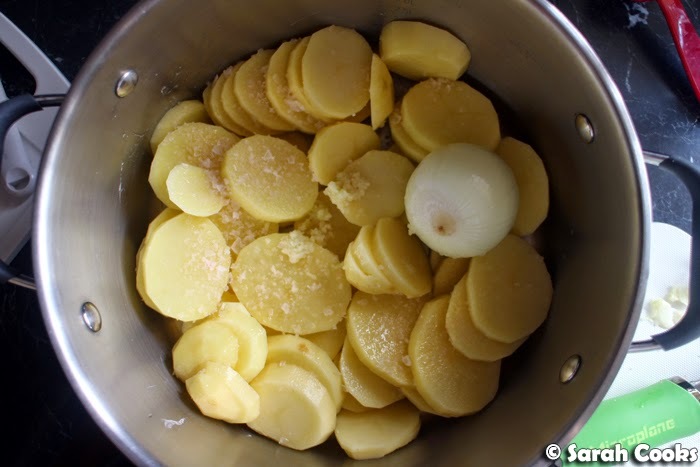 Thick slices of potatoes, salt, garlic, onion, full-cream milk. Yes. 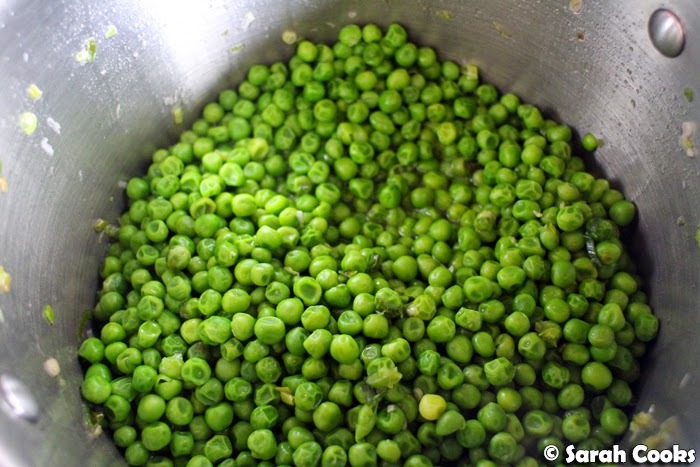 More often than not, I omit the little gem (baby cos) lettuce from this pea recipe, because you only need a little bit, and I always end up chucking out the remaining limp lettuce leaves a week later. I don't really think they add much to the finished dish anyway. For me, it's all about the combo of sweet peas, softened spring onions and chicken stock! I generally use lunch or dinner parties as an excuse to try out new things, so I rarely repeat recipes. However, these dates always go down a treat, and I love them so much that I couldn't not make them again! I guess they're the closest thing I have to a signature dish right now, hehe. I was really pleased with how the chicken turned out. Even though the pieces weren't uniformly sized (I used a whole chicken, chopped up), they cooked through evenly, without any dry patches. Hooray. The thighs were especially tender and juicy (heh). The skin was nice and crispy too - winner! And here's dessert! Forgive my immodesty, but I was really, really proud of it! 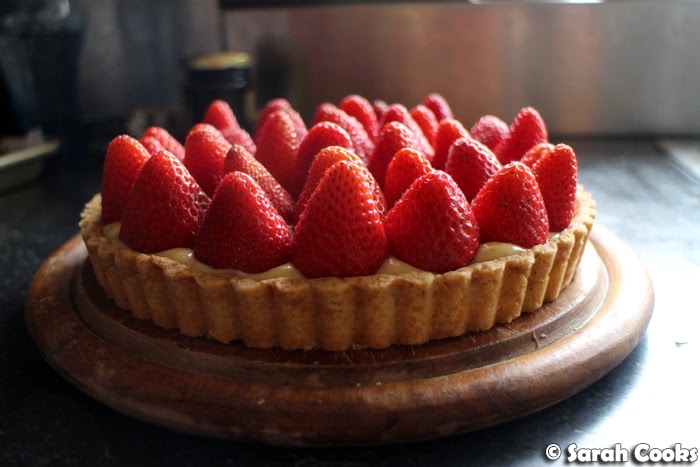 As I mentioned above, I chose to make a classic French strawberry tart as I knew it was a favourite dessert of one of our friends. It's soooo nice to have one freshly made, even if it's a little less perfect looking than the ones you get in pâtisseries - the fresh berries squishing messily into the vanilla-flecked crème pâtissière and through the crumbly pastry is just beyond. I'll be publishing the full recipe soon, so definitely give it a go if you come across some beautiful berries! And that was lunch! Such fun! Do you like to cook new recipes when you have friends over? Or do you like to stick to tried and tested recipes? You should be proud of that tart. It looks amazing. Figuring out how to cook a full lunch for four people is a real art, especially if you're juggling having a few different dishes requiring oven/stove space.